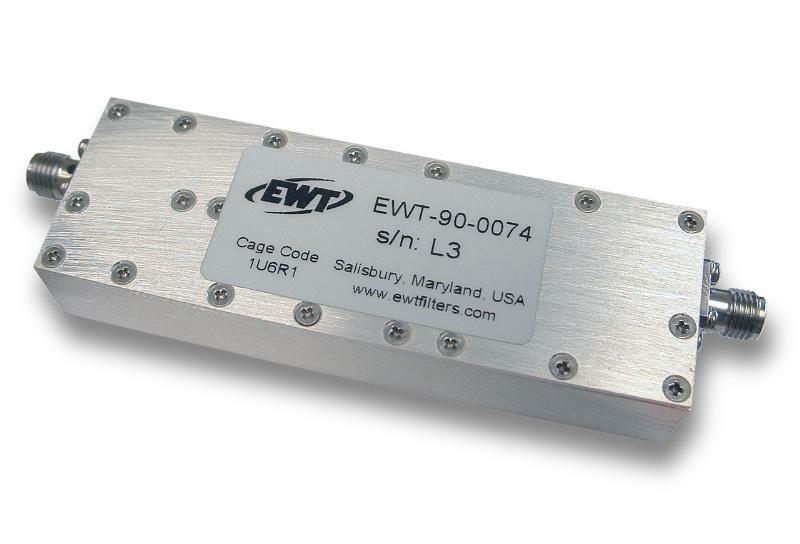 EWT-90-0074 is a new S-Band bandpass filter with integrated group delay equalizer having nominal 3dB bandwidth of 400 MHz. This unit has approximately 1nS group delay variation over 80% of the 3dB passband and 3.2nS group delay variation over the full 3dB passband. Phase linearity over Fo +/- 185 MHz is less than +/- 10 deg. Attenuation is 30dBc at Fo +/- 360 MHz. The overall size is 3.00” x 1.00” x .5” with SMA connectors.